Stitch Story: More Creating with Crochet Remnants! I have been keeping all of the scraps and leftovers from current projects in a little pottery bin on my work table to make into pendants. This pendant was made from an extra cord and set of tassels for a purse I made. By tying the cord into a semi-complex knot, I was able to create a 3D effect when stitched into the pendant. 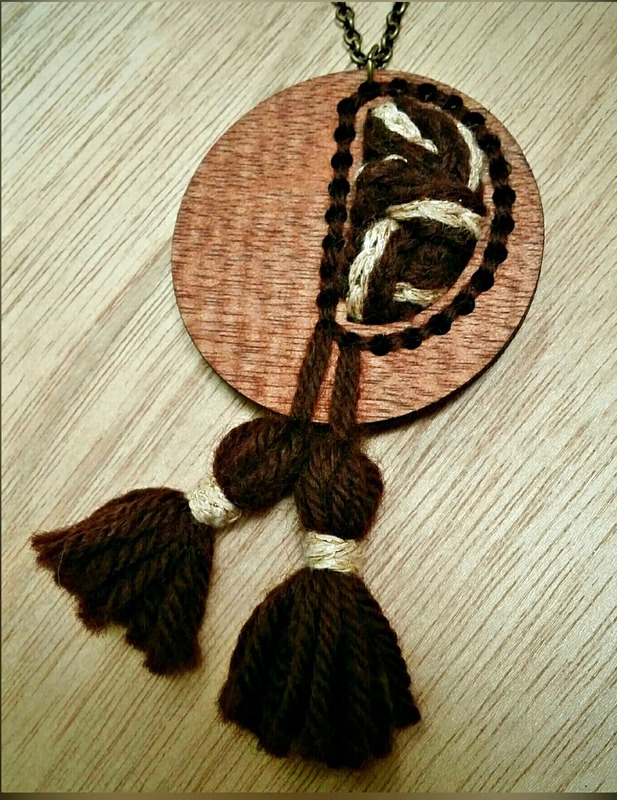 After I finished stitching the knot into the pendant, I realized that the tassels and the cord really need to be together, so I decided to include them as well. The addition of the tassels really changed the look, style, and dimension of the pendant! This opened up a whole new realm of pendant ideas for me to explore. So what started out as scraps, took me down an exciting new creative path! In 2018, I will continue to save my leftovers for more creative challenges. I recently had an idea for embellishing yarn with yarn scraps, so I may never need to throw any scraps away again!